A new study in animals demonstrates that a diet rich in coconut oil protects against ‘insulin resistance’ (an impaired ability of cells to respond to insulin) in muscle and fat. The diet also prevents accumulation of body fat caused by other high fat diets of similar calorie content.These findings are important as obesity and insulin resistance are major factors leading to the development of Type 2 diabetes. The study is also useful for those aiming for weight loss. 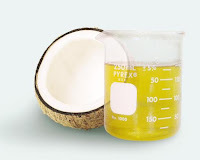 It helps explain human studies showing that people who incorporate medium chain ‘fatty acids’, like the ones found in coconut oil, into their diets can lose body fat. According to the study leader Dr Nigel Turner, “unlike the long chain fatty acids contained in animal fats, medium chain fatty acids are small enough to enter mitochondria – the cells’ energy burning powerhouses – directly, where they can then be converted to energy.” However, the downside to eating medium chain fatty acids is that they can lead to fat build up in the liver. As such, this fact should be taken into consideration by anyone trying to use them as a weight loss therapy. According to Turner, “If someone is trying to prevent weight gain, we can see they may benefit from substituting oils containing medium chain fatty acids for other oils in their diet, as long as consideration is given to the potential problem of excess fat in the liver. Other natural dietary alternatives, such as fish oil, might be helpful because the fatty acids in fish oil are thought to exert a lot of their beneficial effects through improving fat oxidation in the liver.” The findings of the study are now published online in the international journal Diabetes. Source: Insciences report on coconut oil for Type 2 diabetes.